While nothing truly beats a wedding bouquet made of live flowers, there are some problems that can come with trying to make the flowers last as long as possible throughout the wedding without drying out and withering. 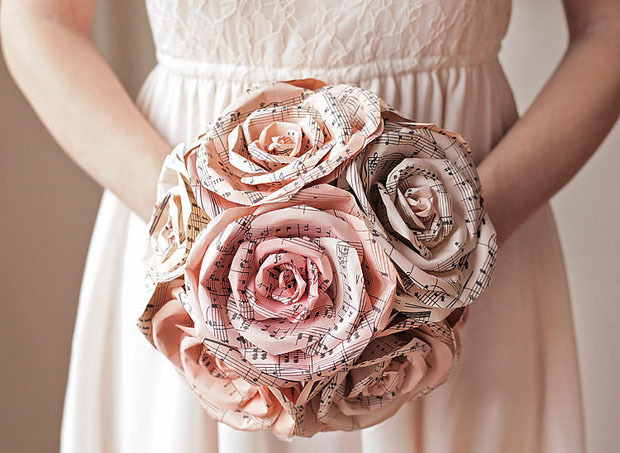 Paper flowers may not be the best substitute for the real thing, but when done right, they can come close – and they can even be used instead of real flowers for floral decor. Fortunately, you can also easily make them. All you need to make them are colored paper, pipe cleaner, scissors and glue, as well as a base, and you’re all set to go. 1. Lay three to four sheets of colored paper (it can also be in different types of paper) down on a flat surface and stack them on top of each other. Once that’s done, fold the paper by taking the bottom edge and folding it over by one inch. Then, flip the sheets of paper over and fold them back on the opposite side. The folded paper should look like a closed paper fan or an accordion once this step is finished. 2. Next, fold the folded paper in half as well as an inch or two of pipe cleaner around the folded paper. Be sure to twist the cleaner, as this will act as the stem of the flower. Placing the pipe cleaners in opposite directions will give different color combinations. 3. Cut the folded paper into three equal pieces and adjust them if needed to make the pipe cleaner at the center of the flower. Trim the outer edges of the paper into rounded edges. 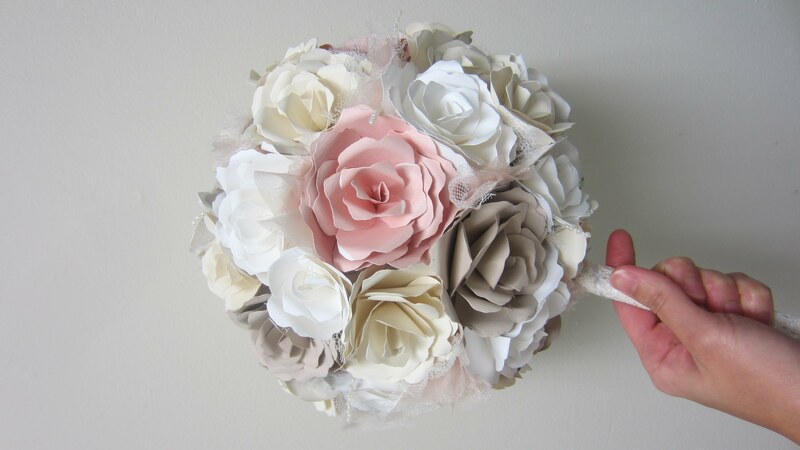 If you like, the paper trimmings can be saved to make confetti that the flower girl can use during the ceremony. 4. Open the folded paper while holding the stem. Pull the topmost layer of the paper all the way around. This will show you the end result, but be careful not to rip the paper, especially if you’re using crepe or Japanese paper. 5. Once you have your finished product, you can repeat the process to make as many as you like. You can even bend the pipe cleaners to make the flowers bend, which will allow you to make different bouquet arrangements in different containers. 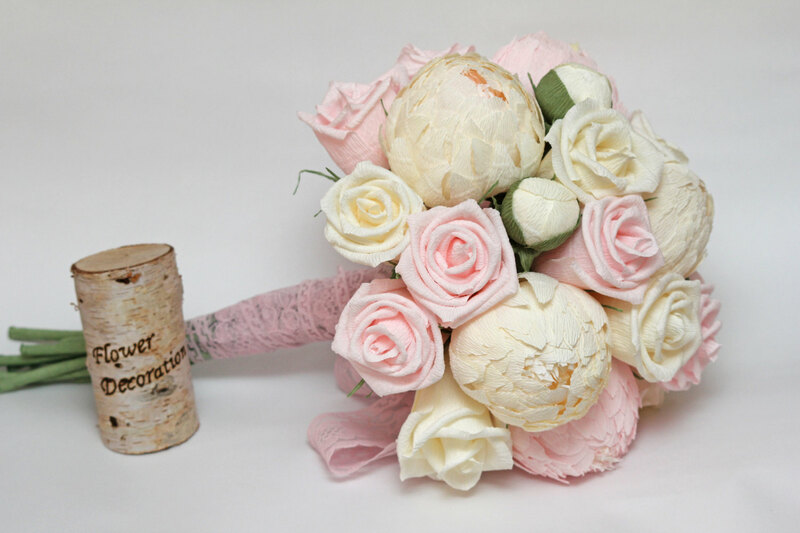 You can also make the same flowers but in different sizes, as well as in different colors combinations depending on the theme of your wedding. When placing them in containers you can add a little more spruce to the arrangements by adding ribbons. Plastic foliage can also work well when paired with paper flowers. Be sure to use a good glue that will stick the pipe cleaner to the plastic.